We are in the middle of solving a little mystery: The Case of the Three Missing Books. The Mom remembers putting them into the "library bag", the Little Sister was a witness, the Big Sister and the Dad remember returning them to the library. But somehow, these books have... disappeared. The investigation began with an all out search and then we contacted the three library branches involved because we Interlibrary Loan. An Interlibrary Loan is when one library borrows a book from another and then loans it out to a patron. We use this service all the time, it is a great resource, just one of the reasons we are carefully examining the path of the missing books. Many phone calls later, coupled with kind library staff searching the stacks for us, still no books. The next step involves a few different options. We will not, however, be like George Washington and just let it go. 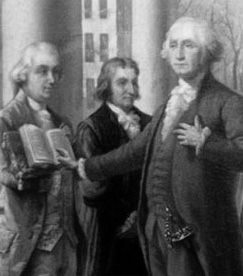 You see, our first president George Washington himself forgot to return a book and that book amassed fines that would approximate $300,000. The unreturned book, "The Law of Nations", was nowhere to be found (click here to read an article and see a photo of the book.) As the story goes 221 years later the staff at Mount Vernon wanted to maintain George's reputation as a good library patron and replaced the book for a mere $12,000. A deal compared to the fines! While we have not solved The Case of the Three Missing Books we have learned a valuable lesson: when a library book is lost call the library, you'll find that the folks who work at the library are happy to help and work with you to find a solution. And while there are no ceremonies for folks who decide to work with the library to find or replace lost books, it feels much better than watching the overdue fines multiply! Take a Challenge, sign up for Weekly Challenge Delivery, follow us on Twitter, tell us where you are from or share your thoughts on the project. The Books for Walls Project loves your participation so tell us your stories and help us get out in the world --thank you! The Case of the Missing Library Books has been solved. And we are officially changing the case's title to "The Case of Too Many Bags." You see, we have a lot of shopping bags --canvas bags, handmade bags, hemp bags, freebies from stores, purple bags, green bags, and of course our library book bags. One of these bags, a particularly fashionable hemp bag, hung innocently, emptily on a hook for several weeks. Please remember: even if a bag hangs emptily, it is not necessarily empty. In that fashionable Oryana hemp shopping bag were the three missing books. I think I heard the books giggling at how cleverly they had hidden themselves. ...does anyone want a shopping bag (or two), we have WAY too many! !